Chelm-on-the-Med© Productions is a new 'platform' of The Chelm Project - parallel to the website that will take Chelm-like stories to television. Chelm-on-the-Med© Productions plans to produce one brief animated news segment per week, designed to close news broadcasts from and about Israel with an item that compliments conflict-driven 'hard' news that dominates the news, with one upbeat and offbeat 'soft' news story for balance - featuring the outstanding visuals of award-winning illustrator Avi Katz. These animated news segments will give tens of millions of viewers an opportunity to LAUGH about Israel, instead of feeling SAD, ANGUISHED, DISHEARTENED, WORRIED, DISENCHANTED, UNCOMFORTABLE, ASHAMED OR ANGRY. Any station - public / non-profit or commercial - that airs news from or about Israel is invited to become an affiliate and enrich its viewers' understanding of Israeli society by broadcasting these zany snippets. Likewise, television stations - large and small - that have 'odd news slots' or 'quirky video spots' are invited to integrate these segments into their existing programming - ad hoc or on a regular basis. Two leading Jewish television stations - Jewish Life TV and The Jewish Television Network (each reaches tens of millions of households across America!) are already waiting to broadcast these segments once backing to cover production costs can be found. Other networks - not all Jewish, are considering becoming affiliates. A huge Taiwan conglomerate launched the world's first model of 'animated news' in November 2009. Their produce is an inferior and inappropriate model for animated news that has given 'animated news' a bad name within the journalism community. 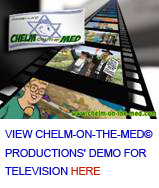 Chelm-on-the-Med© Productions has the only other model for animated news 'out there'. Our product is a superior model that is applicable for any news station contemplating using 'animated news', not just news about Israel. For more about The Chelm Project's other platforms, Chelm's guidelines for animated news and more, download a full presentation of The Chelm Project, accessible on the VOLUNTEERS' TOOLKIT webpage.